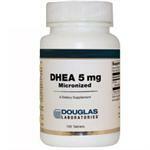 DHEA is a natural steroid hormone that is synthesized from cholesterol through pregnenolone by the adrenal glands. DHEA acts as an antagonist for glucocorticosteroid hormones and is the parent precursor for other important steroid hormones, such as estradiol and other estrogens, and testosterone. While not a precursor to progesterone, DHEA can indirectly influence progesterone synthesis through a feedback mechanism whereby pregnenolone is converted to progesterone based on DHEA levels. Apart from these functions, DHEA also has important biological functions itself. 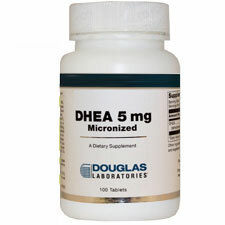 Recent experimental and human studies show that DHEA is involved in a large variety of physiological processes, including immune function, brain function, bone metabolism, blood lipid metabolism, energy metabolism, the regulation of normal blood sugar and insulin levels, and the maintenance of lean body mass. DHEA and its metabolite DHEA sulfate are present in human adult plasma in concentrations of 0.01-0.02 mM and 5 to 7 mM, respectively. DHEA sulfate levels are low in early childhood; begin to rise after age 7, peak at age 20-24, and then drop at a rate of approximately 20% per decade, until at age 85-90, levels are 10-15% of what they used to be at age 20-30. DHEA levels also decline under a variety of conditions of physiological stress, such as acute and chronic infections, and trauma. Vegetarians have been shown to have decreased DHEA levels as well. Not for use by individuals under the age of 18 years. Do not use if pregnant or nursing. Consult a physician or licensed qualified health care professional before using this product if you have or have a family history of breast cancer, uterine cancer, ovarian cancer, prostate cancer, prostate enlargement, heart disease, low HDL cholesterol ("good cholesterol"), or if you are using any other dietary supplement, prescription drug, or over-the-counter drug. Do not exceed the recommended serving. Exceeding the recommended serving may cause serious adverse health effects. Possible side effects include changes in liver function, acne, hair loss, hair growth on the face (in women), aggressiveness, irritability, and increased levels of estrogen. Discontinue use and call a physician or licensed qualified health care professional immediately if you experience rapid heartbeat, dizziness, blurred vision, or other similar symptoms. Keep out of reach of children. To report any adverse vents call 1-800-332-1088.